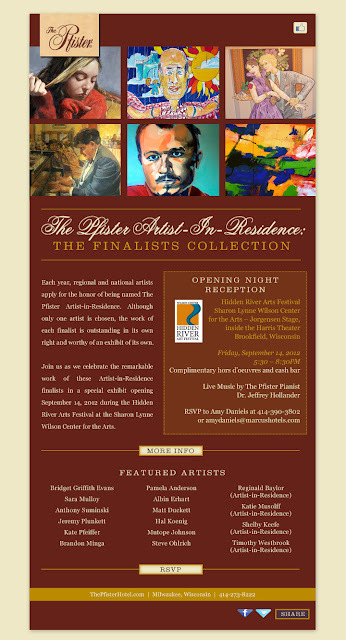 I will be showing 2 pieces of work at the Pfister Artist in Residence Finalists Exhibit: The Collection, with an exhibition opening this Friday, September 14th. This exhibition features a plethora of amazing artwork from 16 Milwaukee-area and national artists. You can find out more about the Pfister Artist-in-Residence program here. In addition, the opening will feature live music by the Pfister Pianist, Dr. Jeffrey Hollander, as well as hors d'oeuvres and a cash bar. It is sure to be an exciting and fancy occasion, as you can see from the the way I used the phrase "hors d'oeuvres" instead of "snacks". I will be in attendance for the opening, so be sure to come say hello! In other news, in March I posted about a grant available from the LIVESTRONG foundation for a hospital Artist-in-Residence program. Thanks to votes from supporters, the Oncology department at Advocate Lutheran General Hospital in Park Ridge, Illinois, received funding to support this program. In the wake of this funding, I have been hired as the Artist-in-Residence for Advocate Lutheran General Hospital/Children's Hospital for one year. I am thrilled to be involved in such an amazing and unique program. I want to sincerely thank everyone who participated in the voting. Supporting the arts in hospital settings can provide patients with comfort, entertainment, distraction, and an outlet for exploration and expression of their emotions. In other-other news, I am embarking on a series of new paintings for a solo exhibition in February of 2013. Be sure to check in for sneak peaks and photos of work in-progress.